Young students are great to have as part of your school for many reasons. When they start younger, they have a higher chance of getting to very high levels of competition. On top of that, many may stay with your school for a long time; bringing their friends along the way. Not only do young students make your school livelier and youthful, they can be a great source of referrals and business, as long as you can get them to stay. Here are some tips on attracting new young students and how to keep them happy at your school. Events – Hosting events geared around kids will be huge in attracting new students. If your school has a “demonstration” program - where you can display the skills of your top students - then you can use these in many ways. During the warmer months, you can host demonstrations in public parks which can draw a lot of attention from the people frequenting the park. 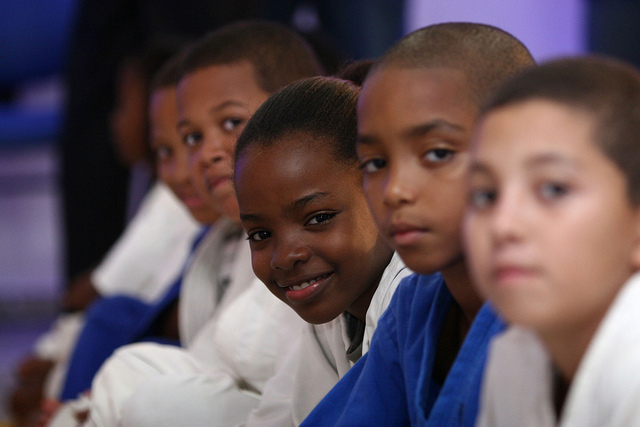 You can contact your local elementary, junior high, and even high schools to see if they'd ever be interested in hosting a martial arts demonstration during one of their events. Get creative! Promotions – With existing members, offering promotions for referral bonuses is a great way to get some new members through the door, young or old. Your referral bonus can be an extension to memberships - instead of cash discounts - to maintain your revenue and your brand's value. The best way to get people through your door is by having your students engaged by emphasizing community. Teachers – Choosing the right teachers to run your junior classes is vital to keeping your students happy and coming back. You have to make sure the teacher is great with kids, personable and knows how to discipline in a fair, nonabrasive manner. This is can be hard to come by but you should pay close attention to how the teachers interact with the students and vice versa. There needs to be a good balance between fun and discipline, with effective learning. Parents – Maintaining a good relationship with their parents is a good idea. At the end of the day, they're the ones paying for their child's membership and deciding which extra curricular programs to send their child to. Invite them to watch a class (if they don't already), and invite them to take part in the adult's class as well. By becoming more familiar with your school, they will become more engaged. Don't forget to invite them to all your special events! As always, like us on Facebook, Twitter or Google+ and stay up to date with all of your ChampionsWay news.